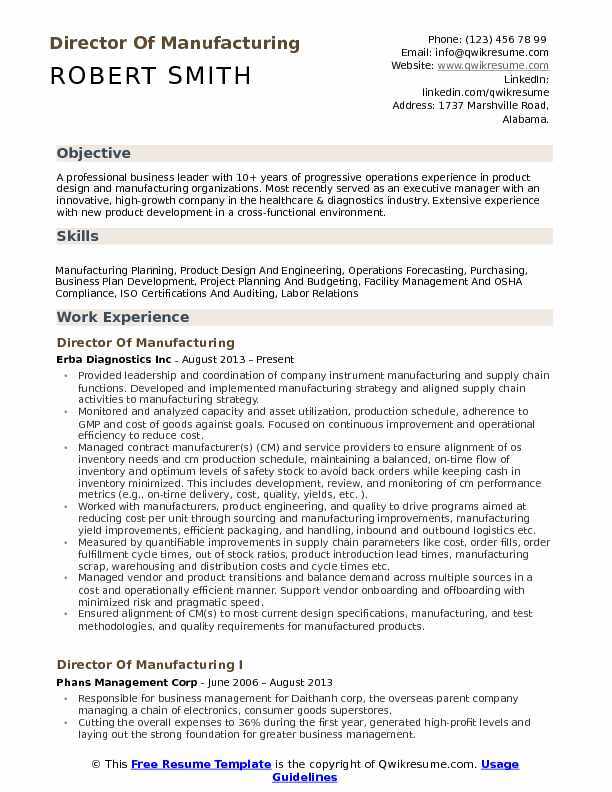 Director of Manufacturing basically oversees the management of the manufacturing segment. 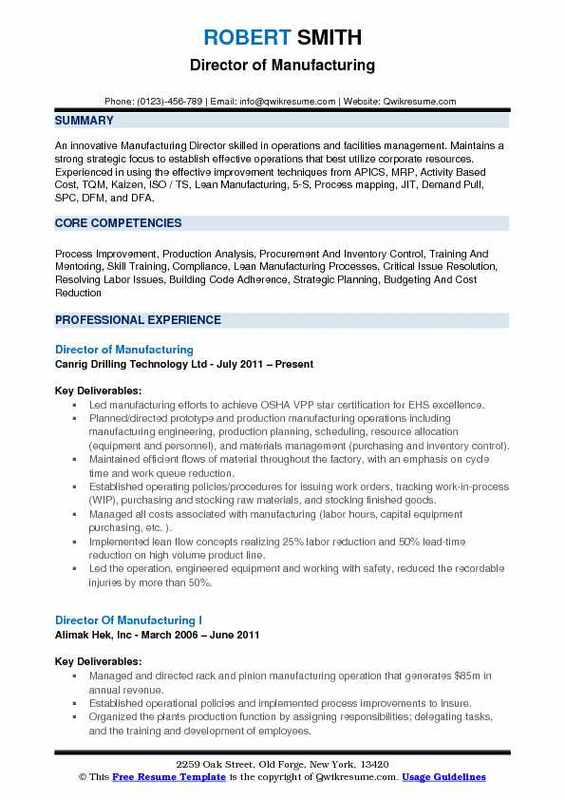 The highlighting duties listed in the Director of Manufacturing Resume include overseeing the manufacturing personnel, evaluating performance, delegating tasks, ensuring that the manufactured goods meet the quality standards, implementing quality-control checks, analyzing production budget, ensuring safety measures are followed, identifying and recommending changes, initiating and coordinating major projects, formulating and implementing manufacturing programs and targeting at least amount of overhead. Most of the Directors of Manufacturing have a college degree with progressive work experience in a similar role. 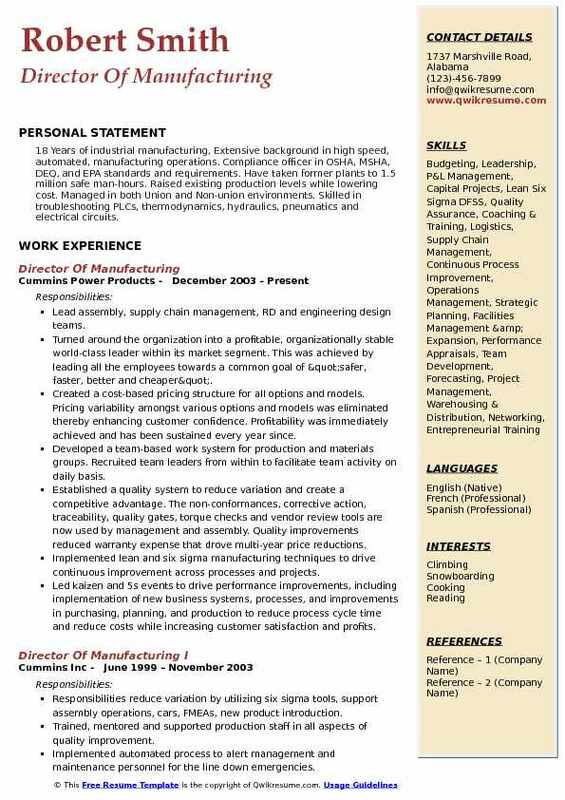 Apart from education and experience, hiring employers often prefer to see in the eligible resumes credentials such as lean manufacturing & quality control, performance management knowledge, technical capacities, stress management techniques, business acumen, presentation skills, and communication abilities. Summary : A professional business leader with 10+ years of progressive operations experience in product design and manufacturing organizations. Most recently served as an executive manager with an innovative, high-growth company in the healthcare & diagnostics industry. Extensive experience with new product development in a cross-functional environment. Provided leadership and coordination of company instrument manufacturing and supply chain functions. Developed and implemented manufacturing strategy and aligned supply chain activities to manufacturing strategy. Monitored and analyzed capacity and asset utilization, production schedule, adherence to GMP and cost of goods against goals. Focused on continuous improvement and operational efficiency to reduce cost. Managed contract manufacturer(s) (CM) and service providers to ensure alignment of os inventory needs and cm production schedule, maintaining a balanced, on-time flow of inventory and optimum levels of safety stock to avoid back orders while keeping cash in inventory minimized. This includes development, review, and monitoring of cm performance metrics (e.g., on-time delivery, cost, quality, yields, etc. ). Worked with manufacturers, product engineering, and quality to drive programs aimed at reducing cost per unit through sourcing and manufacturing improvements, manufacturing yield improvements, efficient packaging, and handling, inbound and outbound logistics etc. Measured by quantifiable improvements in supply chain parameters like cost, order fills, order fulfillment cycle times, out of stock ratios, product introduction lead times, manufacturing scrap, warehousing and distribution costs and cycle times etc. Managed vendor and product transitions and balance demand across multiple sources in a cost and operationally efficient manner. Support vendor onboarding and offboarding with minimized risk and pragmatic speed. Ensured alignment of CM(s) to most current design specifications, manufacturing, and test methodologies, and quality requirements for manufactured products. Led and developed regular operational reviews with existing and new CM’s, vendors and drive consistent improvements through kaizen/lean projects. Maintained and status updated in ERP/MRP of BOM, vendor, PO/PR, inventory status, shipment status etc. Summary : An innovative Manufacturing Director skilled in operations and facilities management. Maintains a strong strategic focus to establish effective operations that best utilize corporate resources. Experienced in using the effective improvement techniques from APICS, MRP, Activity Based Cost, TQM, Kaizen, ISO / TS, Lean Manufacturing, 5-S, Process mapping, JIT, Demand Pull, SPC, DFM, and DFA. Led manufacturing efforts to achieve OSHA VPP star certification for EHS excellence. Planned/directed prototype and production manufacturing operations including manufacturing engineering, production planning, scheduling, resource allocation (equipment and personnel), and materials management (purchasing and inventory control). Maintained efficient flows of material throughout the factory, with an emphasis on cycle time and work queue reduction. Established operating policies/procedures for issuing work orders, tracking work-in-process (WIP), purchasing and stocking raw materials, and stocking finished goods. Managed all costs associated with manufacturing (labor hours, capital equipment purchasing, etc. ). Implemented lean flow concepts realizing 25% labor reduction and 50% lead-time reduction on high volume product line. Led the operation, engineered equipment and working with safety, reduced the recordable injuries by more than 50%. Established and maintained an efficient (lean, 7s) factory consisting of qualified production personnel, supervisory personnel, and process engineering support. Planned/directed training programs to promote continuous improvement of work skills, product quality, and organizational benefits. Summary : Solutions-driven professional with fifteen plus years Production Management experience. 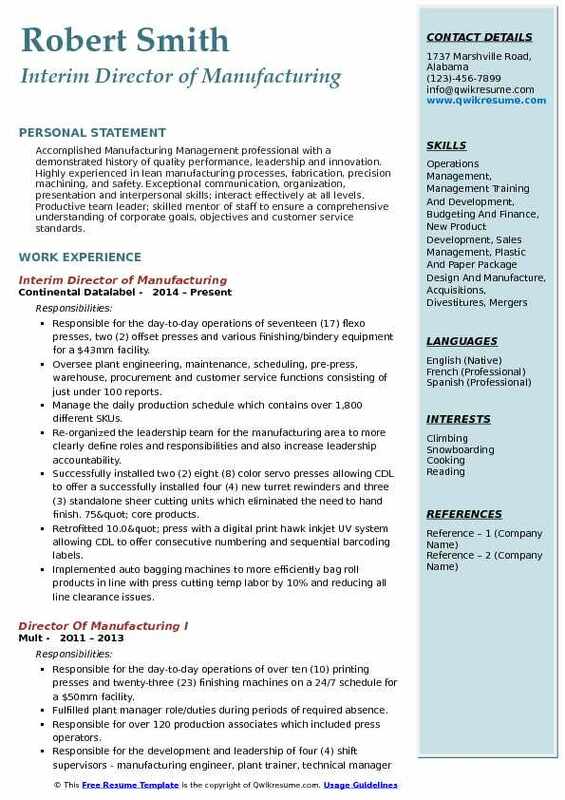 Strong leader with a solid background in Electronics Manufacturing, Quality Control Team oriented individual who can focus and redirect to rapidly changing priorities. A creative problem-solver with an aptitude for manufacturing technology. An articulate communicator who speaks the language of both people and technology. Developed systems that drove the build plan/MRP/build to stock vs build to order-all product lines. Experienced in the transition from NPI-new product introduction to manufacturing and deliver products with high quality. Experienced in nurturing a close-knit relationship with manufacturing engineering and design engineering teams. Ability to interpret and modify ( initiated ECNs ) electrical schematics, mechanical drawings, BOM configurations. Responsible for master scheduling of all manufacturing and MRP activities, did 100% due date signoff. Written dispositions of RMAs returns, discrepancy reports, and non-conforming material reports. Manufacturing corrective actions initiated based on these quality problems. Implemented a sop-strategic outsourcing plan for subassemblies to increase manufacturing capacity by over 40% without new labor hires. Yield tracking-qs changes on all product lines until 100% yield at the top assembly was achieved - all product lines. 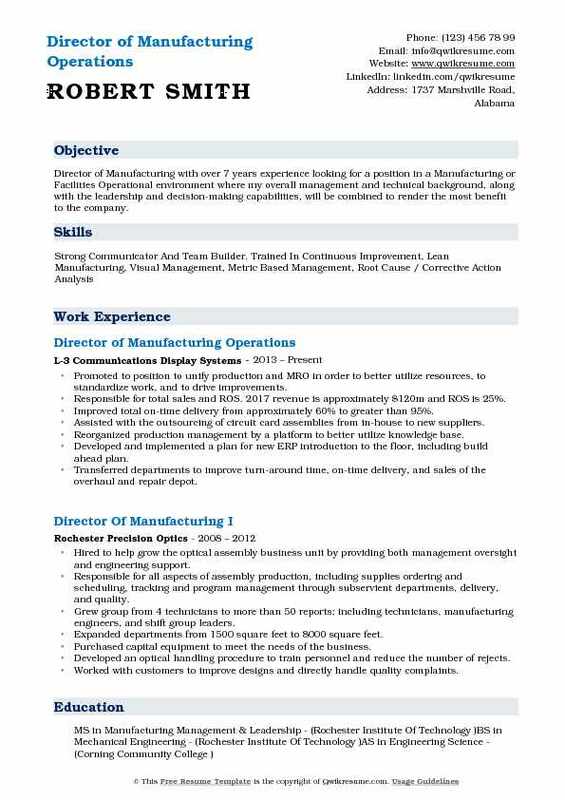 Summary : An experienced Director of Manufacturing who has directed operations, inventory, and personnel with a proven ability to improve productivity and efficiency. Provides objective analysis and innovative solutions to a wide range of problems including cost and productivity optimization, production planning and quality control. Establishes goals and communicates with team members in a way that sets clear expectations. Identify and record any problems relating to product, process and quality systems. 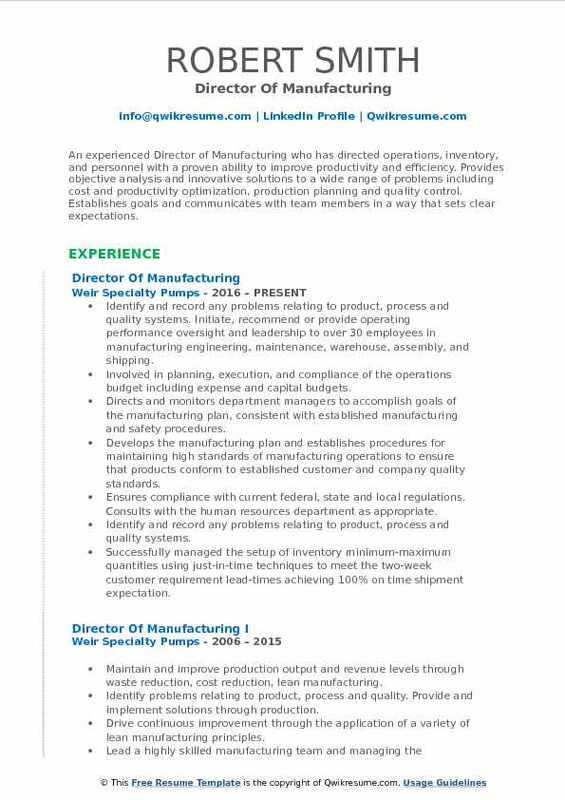 Initiate, recommend or provide operating performance oversight and leadership to over 30 employees in manufacturing engineering, maintenance, warehouse, assembly, and shipping. Involved in planning, execution, and compliance of the operations budget including expense and capital budgets. Directs and monitors department managers to accomplish goals of the manufacturing plan, consistent with established manufacturing and safety procedures. Ensures compliance with current federal, state and local regulations. Consults with the human resources department as appropriate. Identify and record any problems relating to product, process and quality systems. Successfully managed the setup of inventory minimum-maximum quantities using just-in-time techniques to meet the two-week customer requirement lead-times achieving 100% on time shipment expectation. Provided manufacturing support for multiple manufacturing plants and operations. Summary : Accomplished Manufacturing Management professional with a demonstrated history of quality performance, leadership and innovation. Highly experienced in lean manufacturing processes, fabrication, precision machining, and safety. Exceptional communication, organization, presentation and interpersonal skills; interact effectively at all levels. Productive team leader; skilled mentor of staff to ensure a comprehensive understanding of corporate goals, objectives and customer service standards. Responsible for the day-to-day operations of seventeen (17) flexo presses, two (2) offset presses and various finishing/bindery equipment for a $43mm facility. Oversee plant engineering, maintenance, scheduling, pre-press, warehouse, procurement and customer service functions consisting of just under 100 reports. Manage the daily production schedule which contains over 1,800 different SKUs. Re-organized the leadership team for the manufacturing area to more clearly define roles and responsibilities and also increase leadership accountability. Successfully installed two (2) eight (8) color servo presses allowing CDL to offer a successfully installed four (4) new turret rewinders and three (3) standalone sheer cutting units which eliminated the need to hand finish. 75" core products. Retrofitted 10.0" press with a digital print hawk inkjet UV system allowing CDL to offer consecutive numbering and sequential barcoding labels. Implemented auto bagging machines to more efficiently bag roll products in line with press cutting temp labor by 10% and reducing all line clearance issues. Proven ability to train, evaluate, and manage large and successful production employee teams. Processed monthly quality defect data and distributed the information throughout all manufacturing facilities. Summary : Director of Manufacturing with over 7 years experience looking for a position in a Manufacturing or Facilities Operational environment where my overall management and technical background, along with the leadership and decision-making capabilities, will be combined to render the most benefit to the company. Promoted to position to unify production and MRO in order to better utilize resources, to standardize work, and to drive improvements. Responsible for total sales and ROS. 2017 revenue is approximately $120m and ROS is 25%. Improved total on-time delivery from approximately 60% to greater than 95%. Assisted with the outsourcing of circuit card assemblies from in-house to new suppliers. Reorganized production management by a platform to better utilize knowledge base. Developed and implemented a plan for new ERP introduction to the floor, including build ahead plan. Transferred departments to improve turn-around time, on-time delivery, and sales of the overhaul and repair depot. Managed a group of more than 40 reports, including test technicians, assemblers, and cell leads. Implemented sales and operation planning (SOP) to create an ongoing demand plan and then match the supply plan. Summary : I am an accomplished Food Manufacturing Executive with a broad range of experiences and a strong track record of delivering bottom-line results in complex organizations through problem-solving, cost-savings, team-building, front-line leadership and team member development. Directs and oversees operational policies, objectives, and initiatives. Responsible for the outgoing quality, safety, and compliance of all finished products. Responsible for compliance with all federal, state and local regulations and requirements. Manage plant performance improvements based on key performance indicator [KPI] measurements from baseline. Perform duties and requirements as on-site SQL practitioner. Ensure compliance with all food safety. Determine and interpret company policy, and then provide leadership across manufacturing, maintenance, customer fulfillment, and transportation. Oversee all current production activities, manage the development and implementation of near and long-term operating plans to support them. Continually improve and manage the utilization of corporate assets (36mm+). Develop and maintain staffing levels that are responsive to customer needs while promoting high quality. Summary : A quality-driven, goal driven results oriented, manufacturing operations director with extensive Lean manufacturing experience and expertise with a history of increased responsibilities achieving turnaround results and sustainable continuous improvement. Experience includes metal fabrication, machining, assembly & test in automotive, on and off-road transportation, hydraulics, agricultural, and wood industries. Responsible for aluminum, stainless, and assembly divisions comprising of 3 direct and 120 indirect associates. Created a flexible workforce implementation plan for our highly cyclical business by flexing associates and machinery. Continuously engaging and empowering our associates by involving them in our lean activities. Created and implemented bi-annual book club with all leaders – "Monday Morning Leadership now you’re thinking". Led the implementation of 2 kamishibai boards for laser and receiving departments resulting in standardizing daily standard work and reacting on visual indicators. Increased billing per person from $269 to $324 by reducing waste and improving the flow of product. Created a town hall board for the aluminum division which the key members of the team meet at daily to review the metrics and discuss staffing and product needs. Led weekly meetings with all 3 divisions to discuss forecasts and to make sure we review staffing needs to limit overtime. Created and led a cross-functional team to reduce inventory inaccuracies from 52% to 15%. 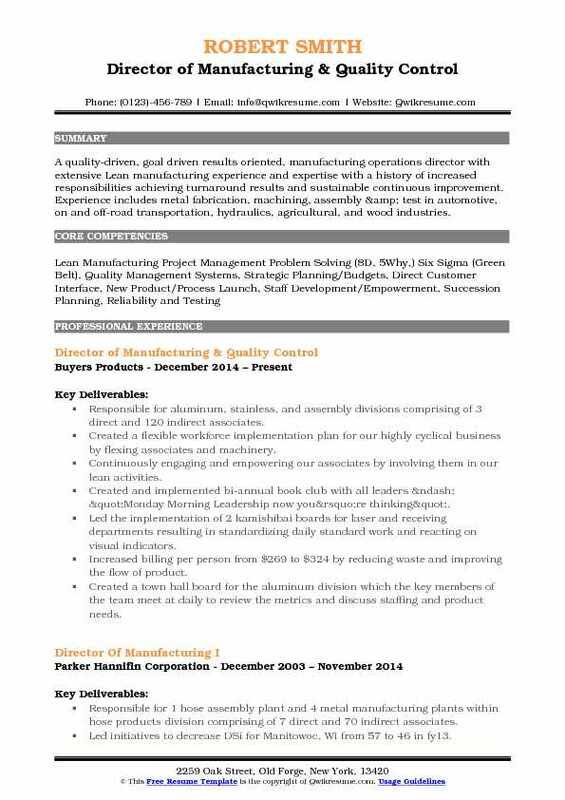 Summary : 18 Years of industrial manufacturing, Extensive background in high speed, automated, manufacturing operations. Compliance officer in OSHA, MSHA, DEQ, and EPA standards and requirements. Have taken former plants to 1.5 million safe man-hours. Raised existing production levels while lowering cost. Managed in both Union and Non-union environments. Skilled in troubleshooting PLCs, thermodynamics, hydraulics, pneumatics and electrical circuits. Lead assembly, supply chain management, RD and engineering design teams. Turned around the organization into a profitable, organizationally stable world-class leader within its market segment. This was achieved by leading all the employees towards a common goal of "safer, faster, better and cheaper". Created a cost-based pricing structure for all options and models. Pricing variability amongst various options and models was eliminated thereby enhancing customer confidence. Profitability was immediately achieved and has been sustained every year since. Developed a team-based work system for production and materials groups. Recruited team leaders from within to facilitate team activity on daily basis. Established a quality system to reduce variation and create a competitive advantage. The non-conformances, corrective action, traceability, quality gates, torque checks and vendor review tools are now used by management and assembly. Quality improvements reduced warranty expense that drove multi-year price reductions. Implemented lean and six sigma manufacturing techniques to drive continuous improvement across processes and projects. Led kaizen and 5s events to drive performance improvements, including implementation of new business systems, processes, and improvements in purchasing, planning, and production to reduce process cycle time and reduce costs while increasing customer satisfaction and profits. Summary : A proven leader with deep knowledge and insight into all areas of manufacturing operations. 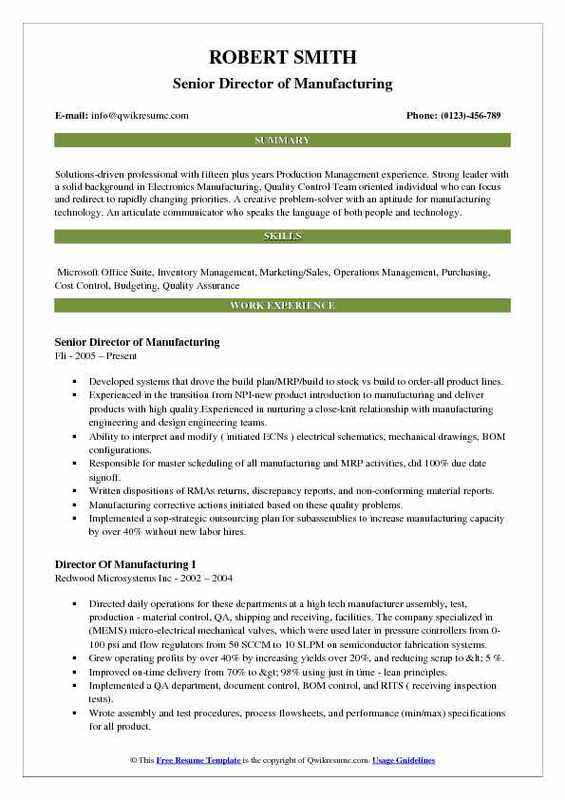 Performance driven Director of Manufacturing with over 18 years in the industry and comprehensive achievements across Product Launches, Engineering, Lean Implementation, P&L, Capacity Planning, and Quality leverages. 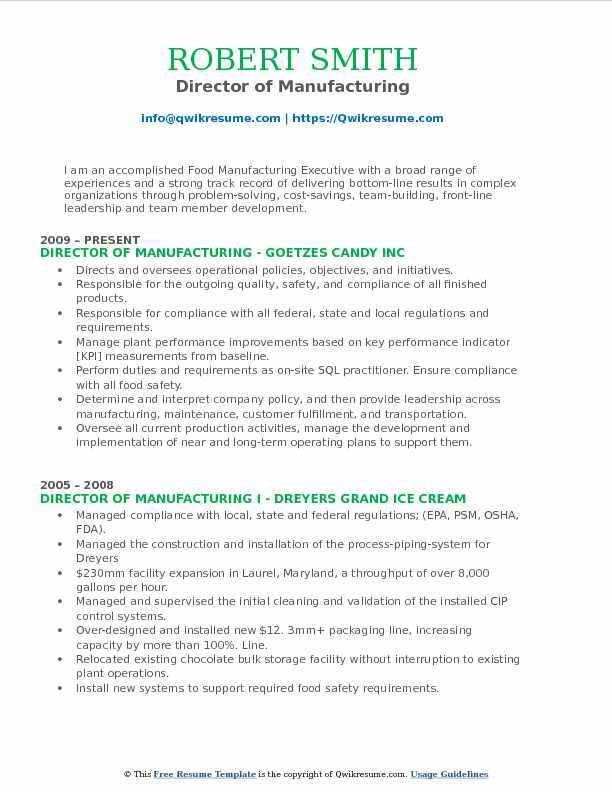 Experience in plant moves, operations startup, plant consolidations, quick ramp-ups. Leads by example, highly motivated, very confident, takes initiative, strong decision-making skills. 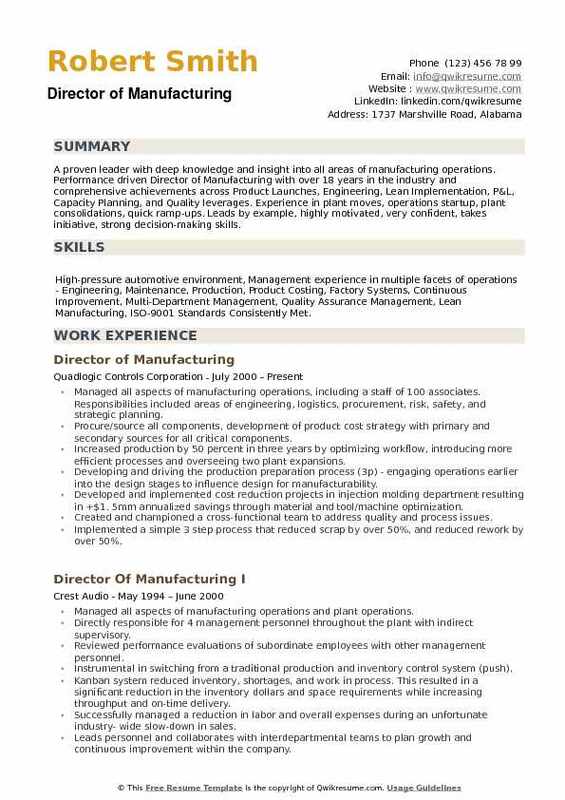 Skills : High-pressure automotive environment, Management experience in multiple facets of operations - Engineering, Maintenance, Production, Product Costing, Factory Systems, Continuous Improvement, Multi-Department Management, Quality Assurance Management, Lean Manufacturing, ISO-9001 Standards Consistently Met. Managed all aspects of manufacturing operations, including a staff of 100 associates. Responsibilities included areas of engineering, logistics, procurement, risk, safety, and strategic planning. Procure/source all components, development of product cost strategy with primary and secondary sources for all critical components. Increased production by 50 percent in three years by optimizing workflow, introducing more efficient processes and overseeing two plant expansions. Developing and driving the production preparation process (3p) - engaging operations earlier into the design stages to influence design for manufacturability. Developed and implemented cost reduction projects in injection molding department resulting in +$1. 5mm annualized savings through material and tool/machine optimization. Created and championed a cross-functional team to address quality and process issues. Implemented a simple 3 step process that reduced scrap by over 50%, and reduced rework by over 50%.